Necessity, they say, is the mother of invention and all too often it’s the utilitarian things, which we often overlook, that make the world a simpler and more functional place in which to live. Such is the case with pallets. They have been around, in one form or another, for hundreds of years and were originally used to store kegs or barrels containing food and drink. These early prototypes were called skids. Their design, however, did not lend itself to being easily transported, which is what we understand to be part of its basic function, today. During the late 1800s skids were in use in factories in America and were moved into place by the precursor to the fork lift truck, the low lift truck. These machines did not have forks and were hand-powered but could lift a skid a few inches off the floor. In 1909 a steel-bodied low lift truck was invented and it featured a lift platform but still had no forks. This was more easily able to move skids into position using a new innovation, casters. However, it wasn’t until the invention of the gas-powered high fork lift truck in the 1937 that they evolved fully. High lift trucks enabled them, with their newly introduced bottom deck, to be stacked vertically, offering more efficient storage capabilities within warehouses and distribution centres. From the basic skid, they gradually began to be adapted to the new technology involved in their positioning. Spacers were added in between the loads to allow the forks in and out, which facilitated easier and higher stacking. Eventually, bottom boards were added to create what we recognise as the modern pallet. This has two main advantages: weight was distributed more evenly and the risk of stringer collapse was considerably reduced. World War II also played its part in the development — in particular, the logistics involved in moving supplies to troops around the world on an unprecedented scale. Faster turnaround times were needed and it was a US Navy Supply Corps officer called Norman Cahners who was inspired to create the four-way to achieve this small but highly effective change. They could now be picked up and placed from any direction, doubling productivity and halving the time it took. It was also around this time that pallet sizes were standardised to further enhance effective storage capabilities. After the war millions of them were surplus to requirements and subsequently many were destroyed. However, some forward-thinking businesses, such as the national railways, saw the commercial value in them as an efficient and cost-effective means of transporting and storing goods in an effort to boost world trade. The most pressing issue was the abundance of different sizes which were prevalent at the time. This caused problems in warehousing environments, where standardisation was vital for efficient transportation and storage. During the 1960s, the railway companies of Europe collaborated to create a European-wide standard pallet which is the basis of the Euro pallet we recognise today. This new standardised pallet enabled railway freight cars to be loaded up to 90% faster than before and led to a trade boom in the economies of all major European countries. 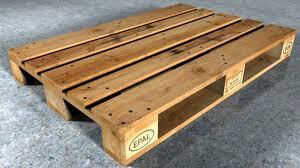 Due to concerns about low-quality replicas, a governing body, the European Pallet Association (EPA), was formed in 1991 to regulate quality. Only those manufacturing companies which belong to the EPA may display the logo. Today there are around 500 million Euro pallets in existence throughout the world, aiding trade amongst nations as far apart as Brazil and China. Although we may disregard the humble pallet, it plays a vital role in the provision of all the comforts we take for granted in life.